The Liberals, socialist communist-Democrats are up in arms because President Trump promised that the Mexicans were going to pay for the border wall and now he is asking for Congress to give the taxpayers money to pay for the wall and they are calling him a liar. Woodrow Wilson won re-election in 1916 with the slogan “He kept us out of war” only to enter World War I a year later. Lyndon B. Jonson said, “We are not about to send American boys nine or ten thousand miles away from home to do what Asian boys ought to be doing for themselves.” During his presidency, the U.S. entered the Vietnam War and Johnson did not seek reelection. Richard Nixon in 1968 claimed to have “a secret plan to end the war” and promised to find a way to have “peace with honor” in Vietnam, but American troops were not withdrawn until 1973 — a little more than a year before Nixon resigned. When George H.W. Bush was in office, he was especially adamant about one thing: “Read my lips. No new taxes.” As you might have guessed, there were, indeed, new taxes. His words were used against him by then-Arkansas Governor Bill Clinton in a devastating attack ad during the 1992 presidential campaign. 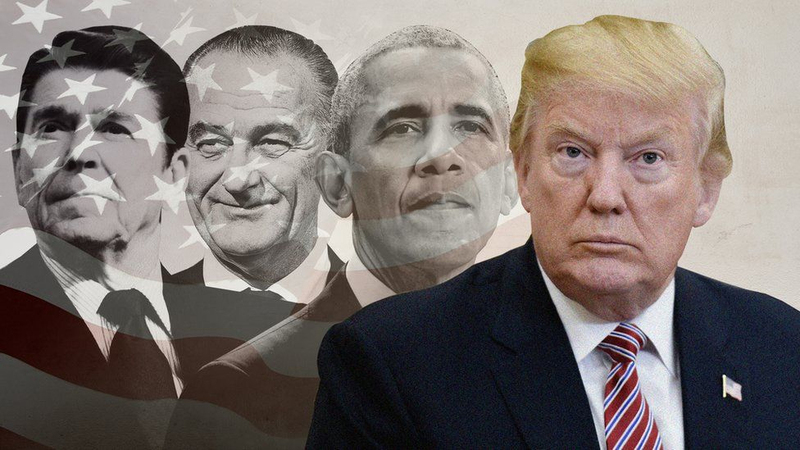 Despite obvious lies by former sitting presidents, the Liberals, socialist communist-Democrats insist on adding lies to the scorecard of President Trump, who most likely will pass into history as the most abused, the most attacked and the most disrespected president in history. President Donald Trump cannot be accused of any ill behavior, sexually or otherwise, since he became the duly elected president by and of the American people; he has not been in any sexual scandal or marriage betrayals — like most Democrat presidential candidates or sitting presidents — but the Liberal and fake news media keep bringing up the two high-priced dancers who have had sexual encounters with a rich and generous real state tycoon who could have been single at the time. what later became a communist-infested nation; that help never arrived — in fact, the “help” never left the USA territory. Then there was John F. Kennedy’s affair with movie stars and Marilyn Monroe in particular, and two secretaries in the Kennedy White House whose primary role was to skinny-dip with the President in the enclosed pool. They also were brought on business trips to Berlin, Rome, Ireland and Costa Rica. American people; he also lied to his wife, his minor daughter, his staff and all those who chose to listen to his lies within his circle of friends and relatives. Let’s not forget our “first half-black president,” Barack Hussein Obama, who told the American people that they wouldn’t have to change insurance plans and they can keep—let me repeat, THEY CAN KEEP — the doctor of their choice, knowing full well that he was not telling the truth; he apparently was not lying to the American people, he was just NOT telling the truth. He also betrayed the American people by going to a communist enemy country called CUBA and then humiliated himself on behalf of the American people by apologizing to the enemy for the way the nation had behaved toward them, ignoring all the Cubans the communist regime had murdered or caused to die. One does not have to be a political expert or a very intelligent person to realize there are many ways to make the Mexicans pay for the wall that will keep undesirables from any country from coming into the United States illegally; the American people have to realize that because the illegals use the Mexican border to enter it does not mean that only Mexicans use that port of entrance; there are many citizens from other countries that manage to get to that point and try to enter onto American soil. Instead of working against the president, the Liberals, socialist communist-Democrats, including the red fake news media that claims to love this country so much, should have been actively preparing themselves for the 2020 election, not with twenty candidates but with one really good one who could give president Trump a run for his money. All presidents lie, but the only one that the Liberals, socialist communist-Democrats, including the red fake news media, keep in mind is the only president working hard to build the country again. The United States can very well raise the price of money transactions when immigrants from any country send money to their families; and we can raise the price when they send medicine, clothing, or electrical instruments to their families, as well as raising the import and export taxes on anything and everything non-citizens bring to this country to sell here — or send there to sell, build, or exchange during inter-commerce transactions. “How” is not important; what is important is that the United States is not going to pay for the wall; it is already a fact that the price of the immigration paperwork has been sky high for those who are here legitimately and want to ultimately become American citizens. The fact is that the American people are not going to pay for that wall. The problem seen in all this is that the Democrats not only fail to accept responsibility but also refuse to accept the truth. They are big-time liars and cheaters, from Gary Hart and John Edwards decades ago, to Kennedy, Clinton and Obama more recently — all were and are Democrats. Just recently in Las Vegas, Nevada, in a forty-eight hour period, three Democrats resigned their posts facing criminal charges for their behavior, not even mentioning the Harry Reid protegee, Ruben Kihuen, who was not able to keep his position as a Democrat Congressman due to the sexual accusations from several women on his staff.